“Not all those who wander are lost”. I start with this line written by J. R. R. Tolkien, as like me Tolkien spent most of his childhood growing up around Birmingham, dreaming of more. But also, like Tolkien Birmingham is not where I spent the first few years of my life. In my opinion those years however early on are what shaped me and installed in me my passion for the ocean. Jeddah, 1990. 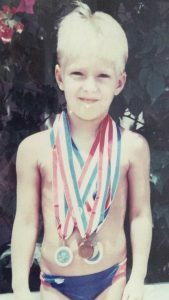 Showing off my medals after a successful swim meet. I spent the first 7 years of my life growing up in Jeddah, Saudi Arabia next to the Red Sea. My parents were both teachers and left the UK to travel and gain experience working abroad. As a result of this the school grounds and facilities on the compound where we lived were my playground. Naturally due to the heat the swimming pool was the go-to place and I learned to swim before I could walk! Living so close to the then pristine coral reefs of the Red Sea the next step after the swimming pool for my parents to take me was natural. By my dads’ side I started snorkelling and saw the wonders that the ocean had to offer! A psychedelic array of colours being displayed by the corals, fish and all other forms of marine life the Red Sea had to offer. And of course, sharks! I only have fragments of memories from these early days, but my parents always told me that all I ever wanted was to be in the water and look at pictures of sharks when I wasn’t able to be in their environment amongst them! Well nothing’s changed there!! As tensions began to rise in the Middle East with the 1st Gulf War my parents decided to make the move back to the UK and my home town of Solihull near Birmingham. For those of you who don’t know where Birmingham is its slap bang in the centre of England as far as you can be from the coast! Not a very fitting place for a water baby with dreams of working on the ocean! So, I got my water fix by swim training and playing water polo every night of the week. To this day I still have no idea how my parents were able to work 12-14hour days and still have the energy to taxi me around in the evenings! So much love for their sacrifices. Other than sport what got me through school was the desire to get to University, study marine biology and get back to living by the ocean and working with sharks! And so the next 10 years of my life went, spending every moment after school in the water training and every night dreaming of sharks. Somehow, with all the after-school sports, I managed to get the grades I needed to take the next step in following my dreams and study marine biology at the University of Liverpool. Coincidently the university my parents met at.. Fate?! Australia, 2009. Always searching for sharks! After 3 amazing years spent in the city of Liverpool and at the marine lab on the Isle of Man, I graduated with a head full of dreams and plans! First plan make enough money to buy a one way ticket to Australia! That’s exactly what I did!! However I decided to add some stops on the way.. 1st stop California. I’d been fortunate enough to have an uncle living in California since I was 8 and so had spent many holidays visiting him and growing fond of the beach, surf lifestyle. 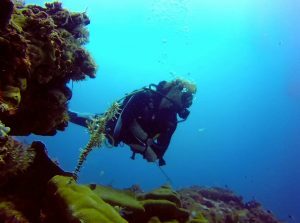 However, I’d heard of the great diving in Mexico and so crossed the border in search of some culture, fun and obviously diving! After getting my lust for diving temporarily satisfied, I made my way back in to California and slowly made my way up the West coast until hitting Vancouver, Canada for a brief visit before flying to Hawaii for some more bucket list dives and stunning scenery. Next and last stop on my 1-way ticket was Australia and hopefully my dream job! How naïve I was!! I quickly found out that its not quite as simple as that and something called experience is required.. But wow what a beautiful country! I fell in love with the coast and lifestyle and soon wanted to stay travel and see what Australia had to offer! After 2 years that felt like 2 weeks it was time to move on and see where I could try my luck next. My close friends in the Gold Coast where I spent the majority of my time were all Maori boys from New Zealand and so without much persuasion, I had my next stop sorted. New Zealand is special! If you haven’t been go, go, go! The people, the cultures and the constantly changing landscapes are mind-blowing! I immediately felt at home there and it will always hold a special place in my heart. Aroha Aotearoa i (I love you NZ). Another 2 years flew by looking for marine biology related work but again being from overseas and having no work experience my cries for work fell on deaf ears. It sounds sad but the 4 years in Australia and NZ however unsuccessful in my attempts to get work in the marine biology field were life changing, making me grow as a person in so many ways. So, the time came to leave NZ. It was with a heavy heart but also with a lifetime of experiences, lifelong friends and the knowledge that I’d be back without a doubt one day. Now, time to get that work experience it was obvious I was going to need if I wanted to work in marine biology outside of the UK. First step I took was to get part time work at the SeaLife Centre in Birmingham where I would be able to not only work with marine life but also show potential employers that I was committed to gaining that much needed experience. Beyin, Ghana, 2012. Saving sharks was always on my mind! It paid off! After 6months I got work in Ghana, West Africa helping to get a new sea turtle conservation program up and running. We worked closely with the small local community providing education and incentives as to the benefits of keeping sea turtle species alive and protecting them rather than seeing them as food. This was my first time in Africa, and it was beautiful! Living with the locals and becoming part of the community was humbling and made me want to experience more! Mafia Island, 2014. Diving and the team/family. I was then offered a job on Mafia Island (yeah, I know what you’re all thinking! ), Tanzania, where I was to teach fish identification and underwater survey techniques of the coral reefs inside the beautiful marine park. I flew in to Mafia on a tiny airplane landing on a red dirt runway, that was a definite first for me! Not only did I conduct surveys on these stunning reefs every day, but I got the opportunity to work with Mafia Island Diving (look them up and plan to get yourself there!!) 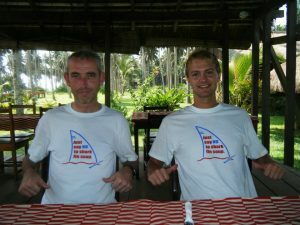 as a SCUBA diving instructor and also collaborate with the marine biologists working on the whale sharks (another dream). On top of spending every day on or under the water which was already perfection, I became a solid part of the local community, speaking Swahili and spending my free time immersing myself in the culture and the village. After 3 ½ years on this little piece of paradise in the Indian Ocean I felt I had to move on. This was one of the hardest decisions I have had to make but I felt that I had more to experience in the world of marine biology and if I stayed longer on Mafia I would never leave (that’s how much I loved it!). What next you might be thinking.. Well on one of the dives I was guiding at Mafia Island Diving I was fortunate enough to privately guide one of my favourite wildlife photographers Nick Brandt and his wife Orla. We got on well from the start and kept in touch. Fate strikes again.. On making my plans to leave and thinking where to go next, I got an email from Nick asking if I would be his camera assistant for a project in Kenya! 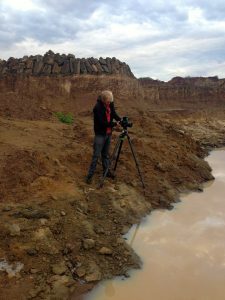 I jumped at the opportunity, flew out to meet him in Kenya and had the privilege of being part of an amazing photography project with an inspirational and talented human. South Africa, 2016. 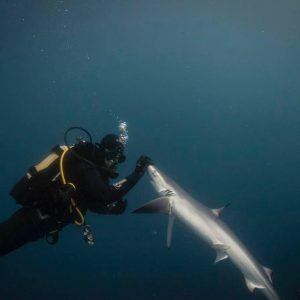 Diving with the Blue and Mako sharks. I’m where I’m meant to be! 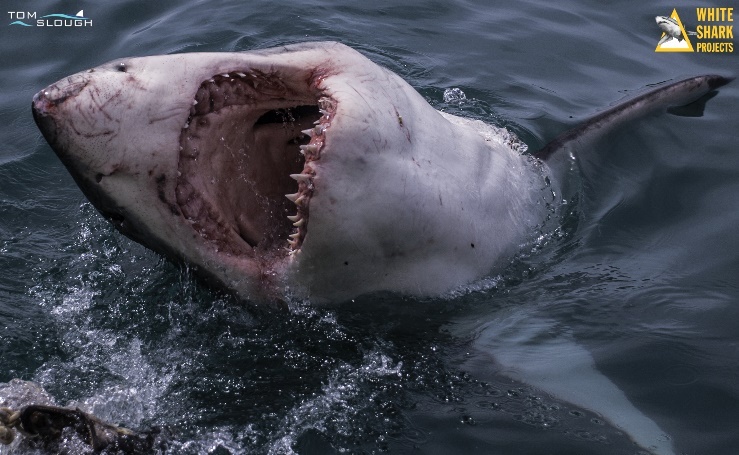 Some of you may have noticed that the majority of the places I visited, especially before moving to Africa have something in common, Great White sharks (California, Mexico, Australia and New Zealand)! Now my dream as I explained at the start was to work as a marine biologist. I love the ocean and have a strong connection with it and would be happy working with any of its inhabitants. However, the ultimate dream was always to work with sharks, and like many of you reading this my favourite was always the Great White shark. They have always fascinated me. The contrast between the raw power they can display against the effortless grace in which they glide calmly and silently through the water. The mystery that surrounded them and still surrounds them to this day, and of course that I grew up with them being this man-eating machine being used to install fear in people which even at a young age I knew was not the case. So, if I was prepared to leave paradise for something new, then I decided I was going to go big or go home! 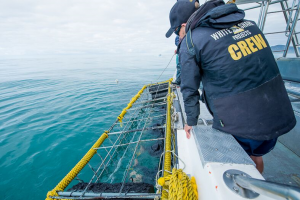 I set my mind on getting to South Africa and working with Great White sharks. Obviously, there were no jobs available (who would give up that!)! I decided to put myself out there, show my enthusiasm, passion and the determination I had to work with White sharks by contacting White Shark Projects, explaining my experience, credentials and that I would love to learn the industry, spend time with the sharks as much as possible and provide whatever I could offer to the company without asking for money, just for the opportunity to be in the same environment as my favourite animal on a daily basis. As luck would have it, I was given the opportunity of a life time and I was on the next flight out to lock eyes with the sharks that have always filled my dreams. I have now been working closely on a nearly daily basis (unfavourable sea conditions being the only thing that stops it being daily!) with white sharks for close to 4 years and it is everything I dreamed of and more! Every day is different, with surprises always popping up. Often in the form of other marine life such as whales, dolphins, cape fur seals, a variety of bird species and other species of sharks. I get the opportunity to change perceptions, educate and also learn more myself every day. Confucius said, “make your passion your work and you’ll never work a day in your life”. I couldn’t agree more. 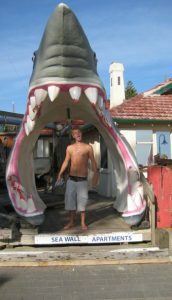 Marine Biologist, White Shark Projects. Sed neque. dictum dolor. suscipit amet, ipsum ante.